It was great to feel the wonderful buzz of conversation around the room as we sipped on champagne before the movie. It was funny having to remind a few of the groups that we were actually there to see a movie! An air-conditioned theatre was a good place to be on a record breaking hot March night. The Lady In The Van proved to be entertaining and thought provoking, and general consensus was very positive. 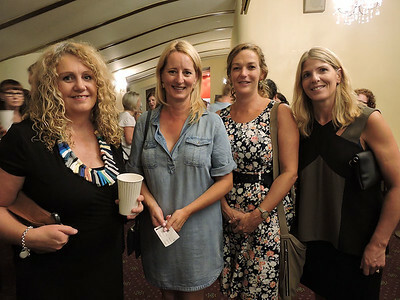 We were especially pleased to see many of our new Year 7 Mums coming along, and joining with other current and past mums to celebrate our common connection. Thanks are also in order for the relatives and friends who joined us too. These occasions contribute to our Community on several levels. They provide opportunities where we can promote community and a feeling of belonging. It allows us to share experiences and meet new friends. And secondly to raise money for the College's Bursary Fund. This Fund, which is administered by us here in the Marcellin Foundation Office, is used to support Marcellin families who may be going through a difficult time (perhaps due to health issues or financial problems). It has also been established to enable families to enrol their sons at the College who otherwise would not have the opportunity to do so. Naturally we don't publicise individual details, but please be assured there is a need in our community for such a Fund to exist. So, it is brilliant that events such as this can support this worthy purpose. So again, a huge thank you to all of you for attending, and please keep an eye out for other events being planned for the year. If any of you feel that you or your family is in a position to contribute in a more substantial manner to the Bursary program through the Foundation, we would love to hear from you. The Foundation is a Not For Profit entity set up to accept donations. These donations are Tax Deductible. Feel free to contact us here in the office if you would like to discuss opportunities for you to contribute to this worthwhile cause.